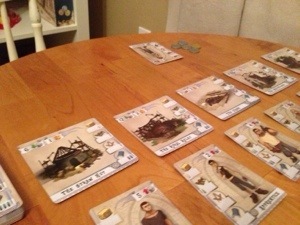 “The Builders: Middle Ages” was a small “game in a tin” that caught my eye at the friendly local game store. At an MSRP of only $17.99, it was arguably an impulse buy. Let’s see if it was worth the impulse! 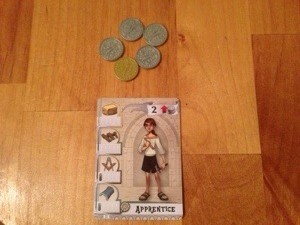 Players each start with 10 coins and an apprentice. Players get three actions on their turn. The first option is to “Start Construction”. There is no spending of coins, merely the selection of one of five cards from the building row. 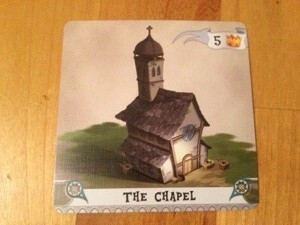 The building card is immediately put into play in front of the player. The second option is to “Recruit a Worker”. This is similar to the Start Construction action – no cost for recruitment. The third option is where money comes into play – “Send a Worker to Work”. 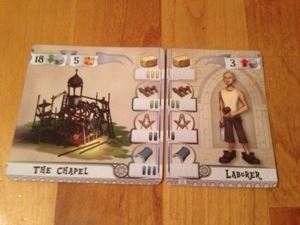 The worker cost is paid and the worker is played on a building in the player’s tableau. Players continue to assign workers to buildings until the resources they provide match or exceed the requirements of the building. At this point, the building provides coins and is flipped over to reward victory points. The player who is first to have 17 points worth of completed buildings brings about the end of the game. Left over coins are worth 1 point per ten coins. Highest score wins. This is the type of game that scratches my “build buildings / place workers” itch in about 20-30 minutes- perfect for a school night or for a filler while waiting for another game to wrap up. Looking forward to many more plays! Off to a very strong start this year, as I played 30+ games in the shorter month of February. The highlight of the month had to be the RinCon fundraiser day (covered in a previous post). I certainly found many other gaming opportunities with friends and family as well. Leading the way were four plays of Monster Factory and three plays of Galaxy Trucker. Keyflower was played twice, as were Agricola: All Creatures Big and Small and Rattus. The last game I purchased and got played in February was Gravwell: Escape from the 9th Dimension. I bought this based primarily based on the high praise it received from the State of Games podcast by Chris Kirkman. The rules are not complex, but the game is pretty mind-bending as you really have to try to anticipate the moves of your opponents. My son played his cards so randomly that it was comical to see how often my plans were foiled! 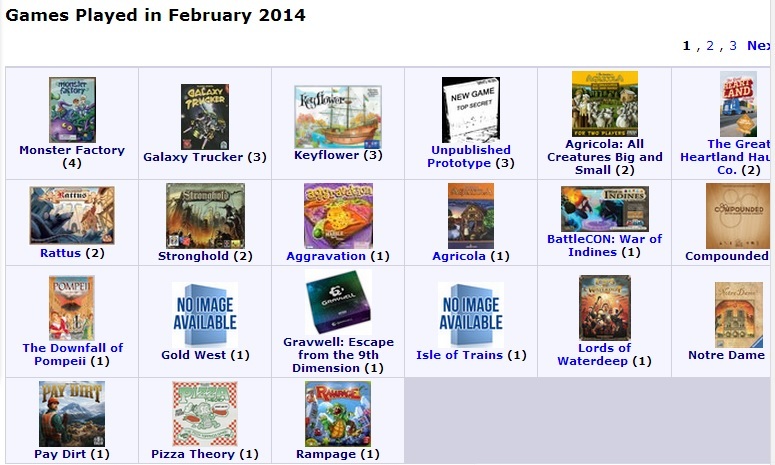 I suspect that March will be a bit quieter in terms of total games played, but having 58 plays in in first 59 days of 2014 is an excellent start!